Howmore is something of a hub for ferries, although the distances to them are deceptively long. The traditional local terminal has been Lochboisdale, where steamers have been calling since 1880 and from which CalMac runs regular, rather than frequent, services to Castlebay, Barra, and on to Oban. There are occasional proposals to revive the route to Mallaig via the Small Isles. A new lease of life was given to South Uist in 2001 when the causeway was completed to Eriskay and the 40 minute-trip to Ardmore, Barra, was opened. Reaching Howmore from the north usually means coming from Uig, on Skye, to Lochmaddy and then taking the fast road through North Uist to the causeways and bridge that link Benbecula. 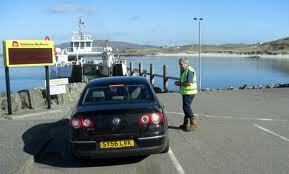 A study of the CalMac timetables will bring its rewards. An early mention in history of Lochmaddy was in 1616, when the rewards illicitly gained by pirates was the subject of complaint.